Following the conceptual approach of previous studies, we normalised flood losses by considering the effects of changes in population, wealth, and inflation at the country level. Furthermore, we removed inter-country price differences by adjusting the losses for purchasing power parities (PPP). We assessed normalised flood losses in 31 European countries. These include the member states of the European Union, Norway, Switzerland, Croatia, and the Former Yugoslav Republic of Macedonia. Results show no detectable sign of human-induced climate change in normalised flood losses in Europe. The observed increase in the original flood losses is mostly driven by societal factors. Despite the existing evidence (see Table 1) of changes in temperature and precipitation in Europe (Alcamo et al., 2007; Rosenzweig et al., 2007; Trenberth et al., 2007) there is no conclusive evidence for a climate-related trend for hydrologic floods either on a continental or a regional scale in Europe (Glaser and Stangl, 2003; Mudelsee et al., 2003; Lindstr¨om and Bergstr¨om, 2004; Kundzewicz et al., 2005, 2007; Macklin and Rumsby, 2007). This supports the hypothesis that a positive trend in the increase of flood losses should be attributed to societal shifts in the exposed areas. These results indicate that changes in population, inflation and per capita real wealth are the main factors contributing to the increase of the original raw losses. After filtering their influence there remains no evident signal suggesting any influence of anthropogenic climate change on the trend of flood losses in Europe during the assessed period. 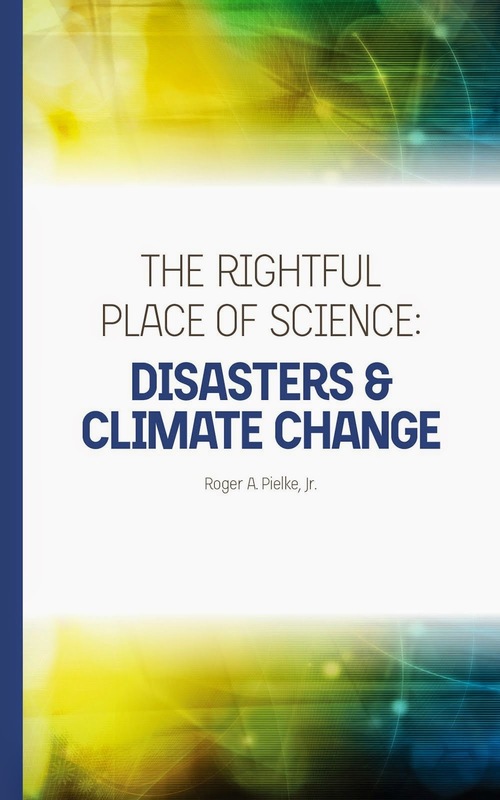 Studies of disasters around the world are unambiguous and uncontested: Increasing damage over recent decades can be explained entirely by societal factors and there is no evidence to support the hypothesis that greenhouse-gas driven climate change has led to increasing disasters. The standard disclaimer applies -- this does not mean that action to address accumulating greenhouse gases does not make sense; as I've stated on many occasions, it does. What it does mean is that efforts to point to contemporary disasters as a basis for action on energy policies are misleading at best.